We’ll admit a comparison test between the BMW M140i and Ford Focus RS doesn’t seem particularly logical on the surface, but there’s a method to the madness. Each demonstrates a different methodology for doing the same thing — turning a garden variety small hatchback into a bona fide road weapon. The BMW M140i is the last of a dying breed, an anachronism wrapped in muscular sheetmetal, garnished with a propellor badge. Rear-wheel drive, manual, powered by a crisp inline-six. Is this really 2017? In the blue corner and staring menacingly in the Bavarian’s direction is the (also German-made) Ford Focus RS, an all-wheel-drive turbocharged four-banger with a ‘personality’ reminiscent of a rally car, as much as a road machine. Clearly both are thrilling. And while they may not seem an obvious pair to cross-shop, a closer look at how they stack up should at the very least be entertaining. Blast off. 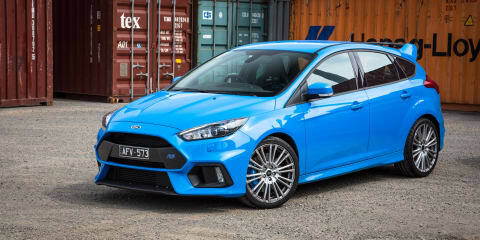 The Focus RS is by far the cheaper car here, at a very sharp (considering the performance on offer) $50,990 plus on-road costs, compared to the BMW at $64,900. The common denominator between this pair is pace — there’s only a tenth of a second in it from 0-100km/h, with the Bimmer notching up a claimed dash of 4.8 seconds (4.6sec for the auto) compared to 4.7sec for the Ford — rather than specification. The Ford’s standard equipment kicks off with an 8.0-inch touchscreen with Sync 3 infotainment including Apple CarPlay/Android Auto app connectivity (from September 2016 production, our test car had Sync 2), DAB+, integrated satellite-navigation, Bluetooth phone and audio, two USB ports and nine speakers. You also get dual-zone climate control, cruise control with a speed limiter, auto-levelling Bi-xenon headlights, rain-sensing windscreen wipers, push-button start, a rear-view camera with rear sensors and ambient cabin lighting. You can also get 19-inch alloy wheels shod with brilliant 235/35 Michelin Pilot Super Sport Cup 2 tyres, which form the optional $2500 extra performance wheel pack. It’s a must. Standard are Brembo brakes with blue calipers, LED daytime running lights, twin exhaust outlets, power-folding mirrors with puddle lights, and a menacing body kit. Safety-wise you get dual front airbags and front/rear curtains, but, unlike all other Focus variants, no side bags – because the racing-style seats don’t hold them. Disappointingly, you also cannot option the Tech Pack available on the less hot Focus ST, which adds low-speed autonomous braking (AEB), auto high-beam, an illuminating blind-spot monitor, rear cross-traffic alert, driver impairment monitor and lane-departure aids. Clearly the Focus RS is all about performance, because it’s not exactly overflowing with luxury amenities. This is in contrast to the BMW, which justifies its $14,000 premium to at least some degree beyond the badge. The M140i gets an 8.8-inch horizontal screen with iDrive 5 controller, sat-nav with real-time traffic and speed limit information, 20GB of onboard storage, DAB+, Bluetooth phone and audio, USB input and a 12-speaker Harman Kardon sound system. Apple CarPlay is a ridiculous $623 option, though at least it’s an industry-unique (for now) wireless connection. You also get dual-zone climate control, cruise control with a speed limiter, adaptive LED headlights with auto high-beam, rain-sensing windscreen wipers, push-button start and keyless entry, a rear-view camera with front/rear sensors, and ambient cabin lighting. Externally there are 18-inch alloy wheels with 225/40 front and 245/35 rear Michelin Pilot Super Sport hoops (no run-flats for the M Division, instead you get a space-saver spare), blue brake calipers like the Ford, a lower-key body kit, and twin-pipes. Safety-wise you get six airbags, alongside an array of tech not found on the Focus such as park assist, low-speed AEB, driver awareness monitor and lane-departure warning. Good but not great. As you might reasonably expect, the Ford’s cabin feels less distinguished, but more purposeful, than the BMW’s. Indeed, the general layout is largely indistinguishable from a run-of-the-mill Focus variant that sells for half the price. Yet the polished silver gear shifter, pedals and kickplates, the boost gauge perched on the dash and the RS-badged leather wheel with electric blue stitching add some welcome edge. Then there are the standard and branded hardshell racing seats trimmed with micro-fibre panels, made by Recaro. They hold you tight in corners thanks to the huge bolsters, but in a daily driver they may grow tiring. Climbing into them requires contortion, as does squeezing out without smacking your knees on the headlight control dial. The lack of height-adjustment grates, as does the way they impinge on rear legroom. The BMW exudes a premium feel that helps justify the price hike, with better-grade plastics, more contrasting materials, a nicer wheel, more tactile switchgear, plusher carpeting and a higher-resolution floating screen with all the performance gauges of the Ford, albeit hidden in sub-menus. There’s the low-slung, snug and driver-oriented feel that BMW has mastered, less grippy but infinitely more comfortable and liveable seats with heating and ample electric adjustment (finished in Coral Red here, but available in black or cream) and subtle M Division badging here and there. Neither car offers rear legroom worth a damn, the Ford because of the hard-shell seats and the BMW because of its rear-wheel drive packaging. Neither car offers much cargo space, at 316 litres for the Focus and 360L for the M140i. But they’re still each still more practical than a two-door coupe. Now we get to the good bits. Under the Ford’s bonnet is broadly the same EcoBoost 2.3-litre turbo-four as used in the entry Mustang, producing an upscaled (bigger turbo, superior exhaust) 257kW at 6000rpm and 440Nm of torque between 1600 and 5000rpm, climbing to 470Nm over a 15-second interval in overboost mode. The engine is brilliant, with a properly aggressive note and lots of pops, snarls and crackles on the overrun. How Ford can squeeze so much character out of this engine here, and not in the vacuum-like Mustang, screams ‘conspiracy’. Torque is sent to the road through a six-speed manual gearbox to an AWD system. There’s no automatic option, which will keep the purists on-side. A manual is lighter, anyway. It’s a good unit with a shorter throw than the BMW’s unit, and while the clutch has an uneven weighting, you adjust quickly. The all-paw system gives you plenty of grip off the line, and in tandem with Ford’s launch control system you can match the 4.7sec 0-100km/h claim easily. BMW uses a very different set-up. It has a TwinPower turbocharger, but the engine is a 3.0-litre inline-six, a rarity in the modern age. Outputs are 250kW at 5500rpm and 500Nm between 1520 and 4000rpm, meaning it’s less powerful but torquier than the more highly strung Ford. Matched here is a six-speed manual gearbox with a lovely crisp mechanical feel, well-weighted clutch and auto rev-matching on downshifts, though this ‘box is special-order only. Most buyers go the no-cost eight-speed ZF automatic with paddles, though for us you still can’t beat the engagement of a three-pedal set-up. Unlike the Ford, the BMW is rear-wheel drive, giving the car a penchant for native oversteer and less traction off the line, which makes the 4.8sec sprint time ambitious. That said, at a kerb weight of 1450kg, the Bimmer is 125kg lighter than the Ford, which pulls the power-to-weight ratio to the Bavarian’s favour. The mechanical differences are notable, and therefore so are the driving experiences. The Ford’s engine is commendably muscular down low, but at its best once you’re screaming higher up the rev band. The exhaust noise can be positively anti-social, and WRC fans are going to recognise that idle. The BMW has a signature metallic, rasping note and a penchant for revs, but is also easier to just totter about with thanks to a greater array of driving mode variances (changing the throttle mapping etc). There’s also the romance and rarity of an inline-six, which cannot be ignored. Here is where the two hot hatches differ most. The Focus RS is a track weapon with a veneer of road-readiness smeared on top, whereas the Bimmer M140i is a road-focused daily driver with extra punch in hand. Ford’s complex AWD system is brand new, and replaces the old RS’s front-drive setup, which was tuned-up to greatness thanks to the torque-steer-taming RevoKnuckle suspension (based off a traditional MacPherson strut set-up) and an active torque-biasing limited-slip diff. Ford’s new four-paw set-up has dynamic torque-vectoring technology, and was developed by UK company GKN Automotive. The system can direct up to 70 per cent of available torque to the rear axle, and distribute 100 per cent of this available torque to either rear wheel. It comprises two front drive shafts, two rear drive shafts, a three-piece propshaft, two electronically-controlled seven-pack clutch packs, a front power transfer unit, and a torque vectoring rear drive unit, which manages front-to-rear and side-to-side torque distribution, and has its own independent electronic control unit. Eight vehicle sensors monitor a raft of vehicle parameters 100 times each second. These include steering, throttle, engine output/speed, yaw rate, lateral/longitudinal acceleration, wheel speeds, the braking and stability control system and temperatures. Deep breath. The Focus RS is also equipped with four selectable driving modes, headlined by the infamous Drift Mode, that helps even an amateur tear up a skidpan. Beyond that there are three stability control settings – on, sport or off – and there are also adjustable dampers that can be manually overridden by pressing the suspension button, positioned oddly on the end of the indicator stalk. Transitioning from Normal to Race adds weight to the steering and increases throttle response, as well as the amount of engine noise pumped into the cabin and from the exhaust. The long and short of the Ford is its peerless nature on a track, and the compromises evident in daily use. The adjustable dampers go from firm to very firm, and combined with the seat and springs make the car oscillate between uncomfortable and very uncomfortable, on even a moderately bumpy section of road. This translates to a fidgety feeling in town, and a propensity to be thrown off line if you hit a mid-corner rut on your favourite B-road. There’s been no attempt to water down the car’s nature. It begins to wear on you as a daily. Yet on a track or a smooth, winding piece of tarmac, it’s phenomenal, with vast reserves of mechanical and tyre grip, preternaturally quick yet light steering, and organ-shifting brakes with lots of feel and minimal fade. I’ll quote CarAdvice friend, former WRC driver and current World Rallycross hero Chris Atkinson, who we sequestered a few months ago in our Focus RS v Subaru WRX STi v Volkswagen Golf R track test, and who would drive rings around yours truly, while blindfolded. “The Ford is the most challenging to drive, the most on-edge, but in a good way. It’s like hopping in a race car and you’re at the edge of the limit, and, with traction control off, you have to drive it well to get a good time out of it. You can easily muck up,” he said. He also said it’s the last car he’d have as a daily driver. The lighter, rear-drive BMW is quieter, softer and more comfortable, and naturally less hard-edged than the Ford. The M140i gets standard variable sport electro-assisted steering with speed-sensitive assistance that ups the resistance at higher speeds, adaptive M suspension with variable dampers (softer in comfort mode, stiffer in sport) and adjustable stability control settings. Its steering is never quite as immediate as the Ford’s, which is borderline preternatural, but it’s progressive and always offers good feedback from the front tyres. Unlike the track-biased Ford, the BMW’s ride is hard to complain about too much, because even when the dampers are set to offer the highest amount of resistance on the compression and rebound the car still rounds off sharper hits well. Body control/handling is typically good, complemented by the ability to flick the tail out with some throttle modulation, and without gimmicks. There’s less grip, but that’s characterful on road. The trade-off against the AWD enemy is that the Bimmer is more squirrelly and requires more corrections in wet conditions, and has less traction off the line. Coaxing regular 4.6s is tough indeed. Yet mechanical grip is still excellent, and the car’s nimbleness and lightness on its proverbial feet keep you out of trouble. Standard-fit are M Sport brakes with signature blue calipers which offer good stopping power, but which did begin to show some fade after about eight laps of Winton Raceway on the media launch last year. Hardly relevant in road, and we drove for this test in mid-summer. Finally, a mechanical limited-slip differential for the M140i is available via dealer order (it’s an accessory fitted here, rather than an option ex-factory) and is currently priced at $5390 fully fitted. If you do track time or want the very best, you need this. It should be standard, really. All told, the BMW’s lack of razor-edge is more than countered by its greater breadth of talents as a daily, with the caveat coming down to your specific requirements. We’d have the Ford as a weekender, if we had something softer in reserve and could afford it as a toy only. The Ford has 15,000km or annual service intervals, at $375 a pop for the first four visits and $520 for the fourth at current price levels (that can scale up with inflation and other cost pressures). That’s very reasonable. You also get a three-year/100,000km warranty, full roadside assist cover and a free dealer loan car. All BMW 1 Series models get condition-based servicing that you can pre-pay for at delivery, kicking off at base level at $1340 for five years or 80,000km of basic cover, expanding for the Plus pack that you’ll need to cover with your dealer. The warranty is three years/unlimited km. We’ve been open about the notion this twin-test doesn’t necessarily represent two cars that’ll be cross-shopped by many people. Instead, it was designed as a way of discussing two very different approaches to hot-hatchery. Suitably enough, each car will appeal to a very different buyer. The Ford Focus RS is a track-honed and razor-sharp car that spits in the face of compromise, that can be a little exhausting to live with but rewards in the right environment like almost nothing else. Especially at the price point. 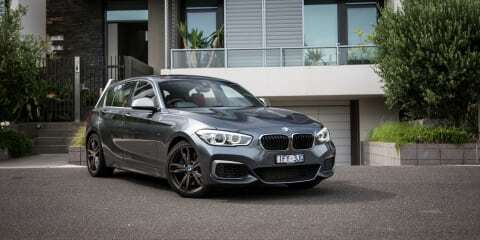 The BMW M140i‘s edges aren’t as hard nor its ceiling as high, but it’s a remarkable product that offers a throwback drivetrain configuration, consummate comfort and luxury, and all the performance 99 per cent of buyers could want. That’s why we prefer it. The Focus’ talent band is thin but spectacular, whereas the Bimmer is Mr Consistent. Listen to the CarAdvice team discuss the Ford Focus RS and BMW M140i comparison below, and catch more like this at caradvice.com/podcast.